First Midland Red is a bus company operating services in Herefordshire and Worcestershire in the English Midlands. It is a subsidiary of FirstGroup. For 1905–1981 history, see Midland Red. In September 1981 Midland Red West was formed with 183 buses operating from six depots in Gloucestershire, Hereford, Worcestershire and Powys as part of the breakup of the Midland Red bus company. In September 1983 the 20 vehicle Bromsgrove depot was closed. The local brand names Reddibus, Severnlink, Wandaward, Wayfarer and Wendaway created by Midland Red continued to be used. Based in Worcester, Midland Red West's main areas of operation were Worcestershire, Herefordshire, parts of Shropshire and parts of the West Midlands conurbation, including Birmingham. Birmingham was also served by the other companies formed from the break-up of Midland Red. In November 1985 Midland Red West introduced a fleet of 60 minibuses to operate its urban network in Worcester as part of a new high-frequency service within the City, operating under the Citibus trading name. The distinctive yellow, orange and blue liveried Mercedes-Benz L608Ds displaced larger buses such as Leyland Nationals onto interurban routes. At its launch the service was the UK's largest urban bus service operated by minibuses. In March 1986 a similar, but much smaller, minibus service was launched for the Kidderminster and Stourport area under the Wyre Forest Shuttle brand. Also operated by Mercedes L608Ds, the buses sported an almost identical livery to the Citibus fleet, with the blue colouring changed to green. A month later minibus operations were also rolled out in Redditch under the Reddilink brand, though larger buses still continued to operate throughout the town on some routes. The L608Ds used here carried a red and yellow livery similar to that of Citibus. In December 1986 Midland Red West along with the 40 vehicle Midland Red Coaches was sold to Midland West Holdings in a management buyout. The livery of many of its vehicles changed from the National Bus Company's poppy red to a deeper red and cream livery. The company also sported a new logo of a Wyvern. Apart from being the name of an imaginary creature, the name Wyvern was also a portmanteau of the 2 major rivers which run through Herefordshire and Worcestershire; the Wye and Severn. In 1987 Midland Red West Holdings purchased the Bristol Omnibus Company from the National Bus Company. It operated urban services around the Bristol area under the City Line trading name, which was kept. In 1988 minibus operations were finally launched in Hereford under the Hereford Hopper brand. Also operated by newer Mercedes L609Ds, the buses sported an almost identical livery to the Citibus fleet, with the blue colouring changed to green. In April 1988 Midland Red West Holdings was purchased by fellow Bristol operator Badgerline. The trading names of Midland Red West and Badgerline remained unchanged as did vehicle livery, though many of Midland Red West's Leyland Lynxs sported a badger motif on the rear sides of the vehicle. The merger reunited the two constituent parts of the Bristol Omnibus Company, City Line and the Bristol country services which had been separated from in 1986. In 1995 Badgerline merged with GRT Group to form FirstBus. In 1999 Midland Red West was rebranded as First Midland Red. In 1990 Midland Red West began to expand and modernise its fleet of full-size single deck buses purchasing 50 Leyland Lynxs, which were put into service at Digbeth depot, displacing all that depot's Leyland Nationals. Eight of these Lynxs shortly found their way to Redditch depot and two years later five of these eight Redditch Lynxes ended up at Kidderminster depot, while Redditch acquired four more from Digbeth. In 1994 37 new Plaxton Verde bodied Dennis Lances, which were now the Badgerline Group's standard full-size single deck bus, arrived at Digbeth, displacing the existing Leyland Lynxs to Kidderminster and Redditch depots. In 2001 First Midland Red Buses won the contract to operate the bus services for Worcester's first permanent park and ride site on behalf of Worcestershire County Council. A fleet of new Caetano Nimbus bodied Dennis Darts were leased for the service, which were branded Worcester North, and operated the service from the park & ride site, located in the Perdiswell area of the city, to the city centre and vice versa. In 2005, two new circular bus routes (W2 and W3) were introduced by the county ouncil which included the Park and Ride site as a stop. 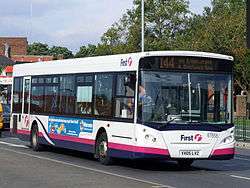 These services were introduced as part of the county council's new Worcester Express services and were also operated by First Midland Red Buses under the Worcester Express brand. The existing Worcester North service between the city centre and Park and Ride site was also rebranded as Worcester Express, and operated as the W1 service. In February 2008 First Midland Red Buses lost the W1 Park and Ride contract which was now operated directly by the county council with their own fleet of brand-new buses under the Woosh brand, which today has now been abandoned by the council due to low demand and budget cuts. The Park and Ride service has since ceased. The company has one depot in Worcester (Padmore Street). In January 2013, the Kidderminster and Redditch depots were sold to Rotala with 36 buses who integrated it with its Diamond Bus subsidiary. In September 2015, First Midland Red ceased operating services in Hereford with the depot closed. At the time it operated 19 buses. The Hereford routes were taken over by Yeomans while DRM took over the service to Worcester. 1 2 3 4 5 6 7 Cole, David (2008). "From Poppy to Barbie: The vehicles of Midland Red West". In Stewart J. Brown. Buses Yearbook 2009. Ian Allan Publishing. pp. 66–77. ISBN 978-0-7110-3295-8.